The final stop in our review of Dominance Points takes us to the mighty SEC. Want to know how good they are? Just ask em’. 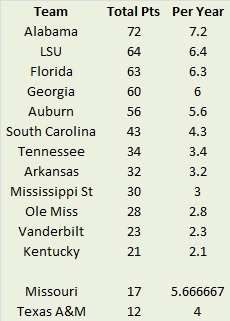 The SEC schools are listed below by Dominance Points. The 12 teams that made up the SEC when the league expanded in 1992 are listed first and the Big 12 teams that joined and stretched the concept of ‘southeast’ to its breaking point are listed next. 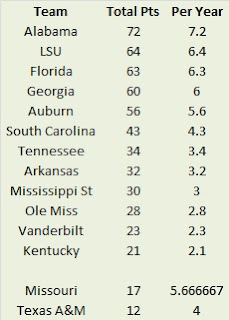 I don’t think many college football fans are surprised to see Alabama as the most dominant team in the SEC. What may surprise college football fans is that Alabama ‘only’ won three SEC titles in the past decade. In the same way that Ronald Reagan ‘only’ won 59% of the popular vote in 1984, this is both impressive and yet not quite as remarkable as you remembered. The leaderboard aligns closely with the number of conference titles. After Alabama’s trifecta, Auburn, Florida, and LSU all have a pair of SEC titles with Georgia adding a single championship. Alabama also has the most SEC Championship Game appearances with four. In 2010, South Carolina enjoyed a historic season by not only playing in their first SEC Championship Game, but also breaking the Florida/Georgia/Tennessee hegemonic hold on the SEC East. In the first 18 seasons of divisional play, some combination of the Gators, Bulldogs, or Volunteers captured every SEC East crown. And speaking of divisional crowns, in just three seasons of play in the SEC, Missouri has already won twice as many SEC East titles as Kentucky, South Carolina, and Vanderbilt combined. In the SEC Championship Game itself, the west has reeled off six consecutive victories (with five coming by at least 17 points). Before we close this chapter of Statistically Speaking, I will leave you with what I feel is an extraordinary piece of statistical minutia regarding the SEC. Since 2005, every SEC team (including newbies Missouri and Texas A&M) has had at least one season with at least four conference wins and one season with at least five conference losses (i.e. a .500 conference record and a losing conference record). Kentucky is the only team to not have a winning SEC record in that span (topping out at 4-4 in 2006). Do with that what you will. Until next time. In this look back on the last decade, we will examine the Big 12 and the Pac-12. What do both of these leagues have in common? Despite their nomenclature, it is certainly not the number of teams, but both conferences did offer a seat at the big boy table to a former Mountain West power, TCU and Utah respectively. The Big 12 teams are listed below by Dominance Points. The 12 teams that made up the Big 12 from its inception through the 2010 season are listed first. The two teams that were thrown life preservers and granted access (or continued access) to big time football are listed separately. The Big 12 was the only major conference to decline in membership following realignment (that is of course discounting the Big East and WAC, which lost all their members). While it could be argued the Big 12 is a better league since realignment, there is no question the league has become more egalitarian since the divisional format was scrapped following the 2010 season. During the six season span from 2005-2010, either Oklahoma or Texas won the conference each season (if we go back to the turn of the century, either the Sooners or Longhorns won the league in nine of eleven seasons). 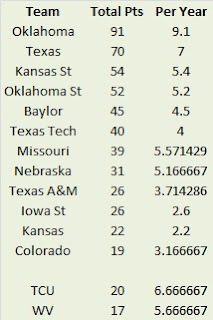 Perhaps not surprisingly, Oklahoma and Texas rank first in Dominance Points by a significant margin. However, since 2011 a new posse of barbarians has stormed the gate. In 2011, Oklahoma State won their first conference title since 1976, Kansas State shared the 2012 championship with Oklahoma, and former whipping boy Baylor won back to back titles in 2013 and 2014 with newbie TCU grabbing a share of the latter. Speaking of TCU, how has the former mid-major fared when going toe-to-toe with the big boys on a regular basis? The Horny Toads are a middling 14-13 in Big 12 play, but are coming off an 8-1 campaign and have the Heisman frontrunner under center heading into 2015. At the bottom of the standings, Colorado technically comes in last, but they have not played a Big 12 game since November 26, 2010. Kansas is your real cellar dweller. After going 11-5 in Big 12 games during the 2007-2008 seasons, the Jayhawks have gone just 4-48 in Big 12 play over the past six seasons and are on their fifth head coach with no respite in sight. 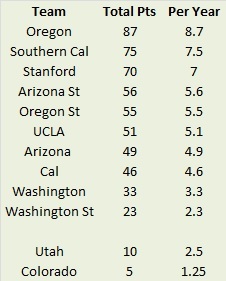 The Pac-12 teams are listed below by Dominance Points. The 10 teams that occupied the conference when it was known as the Pac-10 are listed first. Newbies Colorado and Utah are listed separately. I figured Oregon and Southern Cal would be engaged in a much tighter race at the top. The reason Oregon is in front by a relatively comfortable margin has everything to do with expansion. Southern Cal and Oregon both won four Pac-10/12 titles. However, Southern Cal’s all came when the league had ten members, while two of Oregon’s came in the current 12-team incarnation. That means the Ducks get four additional points because a 12-team league is ostensibly harder to win than a 10-team league. In addition, there is a bigger penalty for not winning the conference once divisional play begins. If a team finished in second place in the old Pac-10, they could accrue up to nine points. However, in divisional play, the most a team could accrue without winning the conference is six points. These small tweaks to the conference, coupled with Oregon’s fantastic play over the past six seasons ensure the Ducks are prestigiously ranked as the most dominant Pac-10/12 team of the last decade by one random blogger with no press credentials and a Geocities quality website. Stanford’s high ranking may be somewhat surprising as the Cardinal were atrocious prior to Harbaugh’s arrival. However, since 2009, they have finished no lower than second in the conference or division and have captured a pair of Pac-12 titles. This may come as a surprise to you, but Cal and Arizona State have each won a share of a Pac-10 title in the last decade. Cal shared the 2006 crown with the Trojans and Arizona State, in their first season under Dennis Erickson, shared the title with the Trojans the next season. Of the original ten teams, the duo from the Evergreen State occupy the bottom of the standings. Washington has finished in the cellar of the conference or division thrice (but none since 2008), while their Apple Cup opponents have finished in that spot six times since 2005! 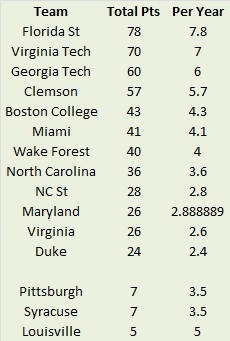 We have finished our survey of Dominance Points for the extinct and mid-major conferences. We now turn our attention to a pair of conferences that condescending SEC elitists might classify as mid-majors, the ACC and Big 10. And yet, which two conferences have produced the past two national champions (in de face!)? The ACC teams are listed below by Dominance Points. The 12 teams that formed the core of the conference are listed first, even Maryland, The Betrayer. The three Big East schools they added (for whatever reason) are listed separately. With three consecutive conference crowns, Florida State has been the most dominant ACC team since 2005. While the Seminoles are not anywhere close to their 90’s dominance of the conference, they have gone 23-1 against league foes since 2012. Both divisions have been dominated by a pair of teams. In the Atlantic, Clemson and Florida State have combined for seven of the ten division titles since 2005 (Boston College and Wake Forest account for the other three). Meanwhile, in the Coastal, Georgia Tech and Virginia Tech have won nine of ten divisional crowns. Those four teams have combined to win nine of the first ten ACC Championship Games, with the other victor coming via Wake Forest in true Cinderella fashion in 2006. Despite a resurgence over the past two seasons, that included a division title in 2013, Duke was so poor in the early part of the decade they still rank last in Dominance Points. The Big 10 teams are sorted below by Dominance Points. The 11 teams that formed the core of the conference are listed first. Newcomers, Nebraska, Maryland, and Rutgers are listed separately. The top of the Big 10 heap is not a dramatic revelation. Prior to the conference expanding and splitting into divisions in 2011, Ohio State won at least a share of the first six Big 10 titles in the period we are examining. Since the league expanded, Wisconsin has the most Big 10 Championship Game appearances with three (although they won in 2012 thanks to sanctions in Columbus and State College) while Ohio State and Michigan State are tied with two. Nebraska has the other appearance. For those easily distracted by the new East/West division set up, during the first three years of divisional play (the Leaders and Legends fiasco), Ohio State and Wisconsin were actually in the same division. Whether that was the Leaders or Legends division is a question that should never be asked. Maryland and Rutgers acquitted themselves reasonably well during their respective preliminary forays into Midwestern football. For Rutgers, after slumming with gridiron peasants like Connecticut, South Florida, and Temple for the past quarter century or so, the guaranteed yearly battles with Ohio State, Michigan, Michigan State, and Penn State likely have fans partying like its 1869. After sorting through a pair of extinct and four existing mid-major leagues, we will now examine the most nascent conference in college football, The American Athletic Conference. 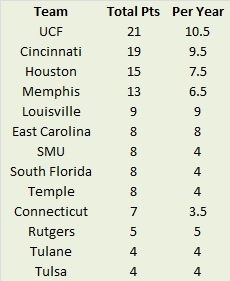 The American Athletic Conference teams are sorted below by Dominance Points. Since the league is entering its third season and has been in constant flux since the very beginning, I have listed each team together. It’s hard to proclaim any bold truths after just a pair of seasons of play, but UCF is the early leader in the clubhouse. After a historic 2013 season when they upset presumed overlord Louisville and earned the league’s first and only BCS bowl berth, the Knights finished in a three-way tie atop the standings in 2014 with Cincinnati and Memphis. For Memphis, this represented a tremendous reversal of fortune, as the Tigers shared the cellar with Temple just a season before. Much like the Atlanta Braves a quarter century ago, the Tigers went from worst to first. They were also ranked in the final AP Poll (their first ever end of season ranking) and the second year in a row the American finished with a least one team ranked in the final poll. The American will experience another change in 2015 when Navy joins the conference (the first ever conference appearance for the Midshipmen) and the league adds a championship game. How long will the American remain in its current incarnation? The dog days of summer have seen rumors emerge (some credible, some incredible or is that uncredible) about another round of conference expansion. Enjoy this edition of the American while it lasts folks. The classic Tulsa/Navy intersectional matchup may not stand the test of time.